Prior to this month, have used USB out to Devialet 440 and worked perfectly. Changed nothing, went to play something last week and no zone for Devialet. Upgraded roon firmware to version above, upgraded Devialet firmware to 13.1.3, tried 3 different USB cables…USB does not show up on the Audio settings page anymore. Roon logs on a reboot no longer say anything about USB, prior logs have all kinds of DEVIALET references. I can’t find any errors in the latest logs, just nothing about USB anymore. Can play songs fine through my iPad, which still shows up as a zone. If you connect the Devialet via USB to a different device are you able to play to it? Yes indeed. Same USB cable and hooked up my mac mini and played via iTunes, works fine. Good idea…I’ve tried various sequences of unplugging/plugging first the Devialets then the Roon, then the other way around…still no USB. Can you please share a screenshot of your Roon Settings -> Audio Tab? You can use these instructions to share screenshots on the Community website. Do other USB zones show up as expected other than the Devialet? Here you are. I’m afraid I don’t know of any other USB devices I could play music through…suppose I could play though my laptop if I had a USB cable with two type A connectors, but I don’t. You mentioned that you tried to use the Devialet with your Mac Mini via iTunes, but does it show up when you are using the Mac Mini to temporarily host the Roon Core on it? How long is the USB cable? I had a similar case recently where the USB cable was 3+ meters and was causing an issue with a DAC showing up. The USB cable choices I have are 2 meters or less. I wish I could hookup my mac mini but it takes USB type A connectors and the Roon takes USB type A and all my USB cables are the regular ones with 1 type A and 1 type B. The Devialet takes a type B.
I do have one other idea here which we can try. If you install Roon on your Mac Mini and use it as a Roon Remote, do you see your Devialet as connected to the Mac? I know you mentioned that it works as expected through iTunes, but is this also the same for when you use it as a Roon Remote? I’m afraid you lost me on this one. Roon Remote isn’t available on OSX just iOS, and if I install server someplace else don’t I need another license? If you install the Roon app on your OSX you can select your Nucleus as the Core and the app goes into “Roon Remote” mode, meaning you will only need one license to keep the Nucleus as the Core and the OSX can be the Roon Remote accessing the Nucleus. 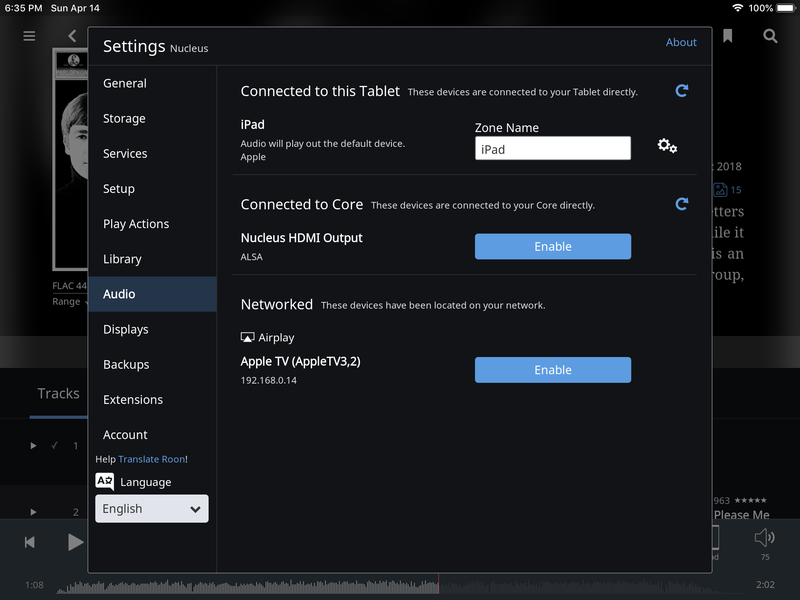 When in this mode, you will also have access to any devices connected to the OSX, so my suggestion here would be to give that a try and see if the Devialet shows up when the OSX is in Roon Remote mode.